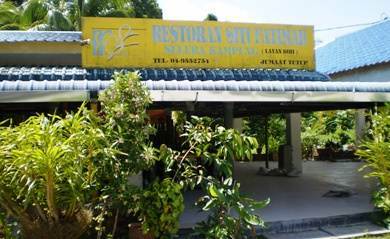 While this restaurant is located in Kuah area but not in the main city center. If you are a tourist and trying to locate the restaurant for the first time, it may take a while to find it. It's in the village (kampung) Mata Air and just before the Tok Senik Resort. The locals who know it will keep coming back for the sumptuous, fresh and cheap food it serves during lunch. It also serves breakfast though. The restaurant serves traditional Malay food (mostly northern Malay dishes) during the lunch time. The best time to come would be around 11:30am to beat the rush. Because of its high popularity, this is also a lunch spot for many local tour operators who bring their tourists here to give them true authentic flavor of local cuisine. If you are coming from Kuah, then drive along the main road Jalan Padang Matsirat that leads towards the airport. After crossing Langkawi Hospital you will get a traffic light. Turn right and shortly thereafter the restaurant will be on your right. With many different trees and plantation on the ground, the overall ambience where the restaurant is located looks quite green and inviting. This is a family owned restaurant and owners family lives in the house on the backside of the restaurant. 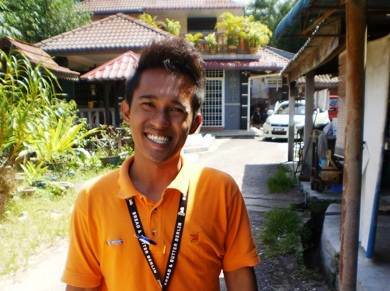 They also have a homestay arrangement for tourists. Coming back to the restaurant, if you come during the peak hours like 1pm or so, it will be buzzing with tourists. while the area is quite large and there is enough seating, you may still struggle to get a seat during the rush hours. And once the rush is gone, so will be the food (well mostly). So what are our favorite dishes at Siti Fatimah? Well they serve a wide range of Malay dishes (once I was counting and gave up after having counted 50. There must be some 70 plus varieties all arranged on a large table). They are all served in a buffet style. So you pick up whatever you want and then go to the counter and pay for what you picked up. They offer several different types of Ikan Goreng and Ikan Bakar (Barbecued Fish, try cat fish if you like) and also great Ayam Goreng (fried chicken and our top favorite here). While the chicken is crispy from outside, inside it is still very tender and moist. Great taste. The coconut chicken curry is also prepared very well. If you love fish, then definitely try out the salted fish curry (gulai ikan talang masin)... it's really fantastic! You can also go for grilled or fried fish with different kinds of sambals, hot condiments or even tamarind juice in shrimp paste... great stuff!! On the table you will find plenty of vegetables, salads and curries, and of course hot condiments like Air Asam, Sambal Belacan and Sambal Belacan Keresik. Do not forget to order some beverages ('minum'). They make different kinds of drinks including iced tea. The staffs are very friendly and quite efficient. But remember that this is after all a budget restaurant where people come here for cheap & good fresh food. So this is not a place where you want to spend a long time and enjoy a chat with family or friends, rather focus on the food, eat, be happy and move on. They serve breakfast and lunch. Open from 7am until 5pm. Closed on Wednesdays.